The tactical apparel brand made some waves in Las Vegas when it debuted its newest product lineup. 5.11 Tactical recently capitalized on SHOT Show 2019 to unveil an extensive variety of new products, which includes apparel, boots and packs. The 2019 product line refines a number of 5.11's different selections, with the addition of some new items and tweaks to some of the more popular ones. The folks at 5.11 claim the 2019 collection features "innovation, customization and versatility" throughout, so let's take a look at what all they're offering these days. "5.11 relies heavily on end-user testing and feedback in the design of our products, and we had been fielding a constant request from operators to build versatility into our new 2019 product range," said 5.11 Tactical CEO, Francisco Morales in a press release. "In addition to mission-specific gear, operators are looking for products that perform across a wider range of missions and adapt to users preferences-- be it on-duty, heading to the office, or off to a training environment--with complete ease. "Our 2019 product range offers our users easily customizable and feature-rich products that tackle the challenge of versatility." When 5.11's AMP (All Missions Pack) line debuted at SHOT last year, it aimed to conquer any task you could put in front of it. Following a rush of positive feedback, 5.11 decided to expand the line with the addition of the AMP10 Backpack. This 20-liter bag features 5.11's HEXGRID load-bearing system, as well as interior compartments and webbing loops for your concealed-carry weapon and small valuables. Users can effortlessly swap their two-strap operation to a cross-body pack if they prefer, using a nifty fastener that connects the straps to the pack. 5.11 also added a highly adaptable, tactical bag collection, which offers three options: a full-size, a smaller sling pack and a crossbody/waist pack. These are called the LV18, the LV10 and the LV6, respectively. Next is the Range Master Pack and Bag Collection, which is exactly what it sounds like. This is for the ultimate range junky who can't shoot enough. Often when especially serious shooters hit the range, they find themselves carrying in more gear than they can handle, causing a level of disorganization. You have your choice of the Qualifier, the Duffel and the Backpack, which get bigger in size as you move up. 5.11 also introduced another pack from the All Mission Pack system, the AMPC Pack, which you can mount to the All Missions and Tactec® Plate Carriers or simply carry by itself. And finally, 5.11 unveiled the All Missions Rig, which is a low-profile pack system that you can easily customize. A number of pants came with the new wave of 5.11 products. 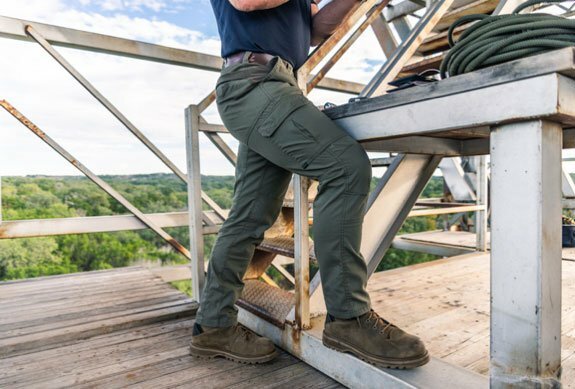 First is the ABR Pro Pant, which features reinforced knees, nine pockets, a seat, a fade-resistant tool strap, FlexLite stretch ripstop fabric and an updated fit, making it functional for both work and casual purposes. They'll also be adding a more lightweight option in the Bravo Pant, which features seven pockets and water-repellent, four-way stretch fabric. The Vista Pant and the Harper Tight offer shooters additional lightweight options, but with a slimmer fit. The Capital Pant and the Icon Pant take a more utility-heavy approach, while remaining flexible and comfortable. The A.T.A.C. 2.0 boots will be lighter than their predecessor, and the Norris Sneaker and Apex™ 6" Wedge give 5.11's casual footwear a facelift, offering sneaker-looking shoes to those with a more rugged lifestyle of occupation. The brand gave three of its best-selling roller luggage bags an update, too, as the CAMS, the SOMS, and the Mission Ready all now come with reinforced and replaceable parts. It's coming out with a new, smaller luggage bag, too, called the Load Up 22" Carry On. Not only did 5.11 come out with a "Desert" pattern to its Geo 7 Camo collection, but also the Class-A Fast-Tac® Twill uniform for men and women, which adds to the brand's professional products. And finally, 5.11 added the Surplus Men's and Women's Jackets, which are military-surplus-style jackets, which feature cargo pockets, the dual ReadyPocket concept, as well as the RapidDraw pass-through pockets. "5.11 Tactical is becoming an iconic global consumer brand rooted in serving public safety and military professionals. And now, we are creating seamless experiences for our consumer line across all channels including our retail stores and our e-commerce site with new, innovative and technical products that offer comfort, durability and functionality," said 5.11 Chief Marketing Officer Debra Radcliff. "SHOT Show is a key opportunity for us to meet with dealers, operators, media and customers face-to-face, have meaningful conversations and build lasting relationships. "Through our Always Be Ready brand mantra, 5.11 Tactical is inspiring the world to find their inner warrior."